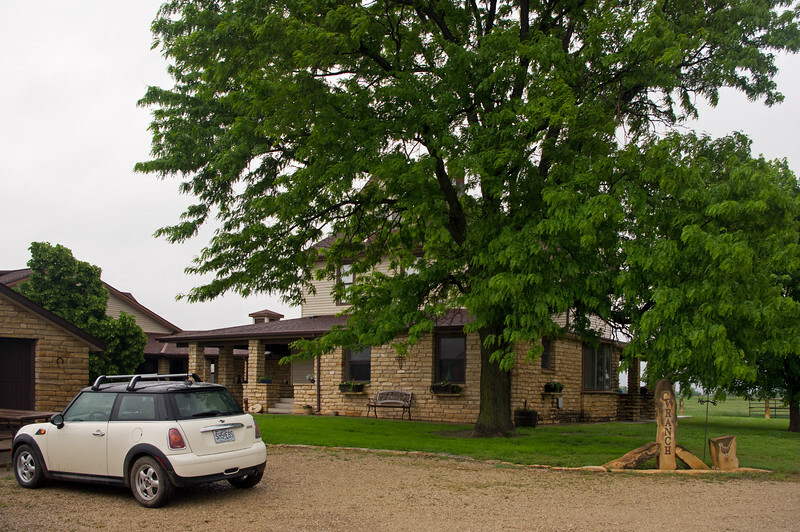 We arrive at the C & W Ranch near Salinas, Kansas on a rainy day. (Actual address is Smolan, KS) Our accomodations in the 'bunk house' are satisfactory. The Garden of Eden, Lucas, Kansas. Samuel P. Dinsmoor's Cabin Home is built from "logs" of post rock limestone. Dinsmoor was a Civil War Vereran, Mason, and free thinker who moved to Lucas in 1888. 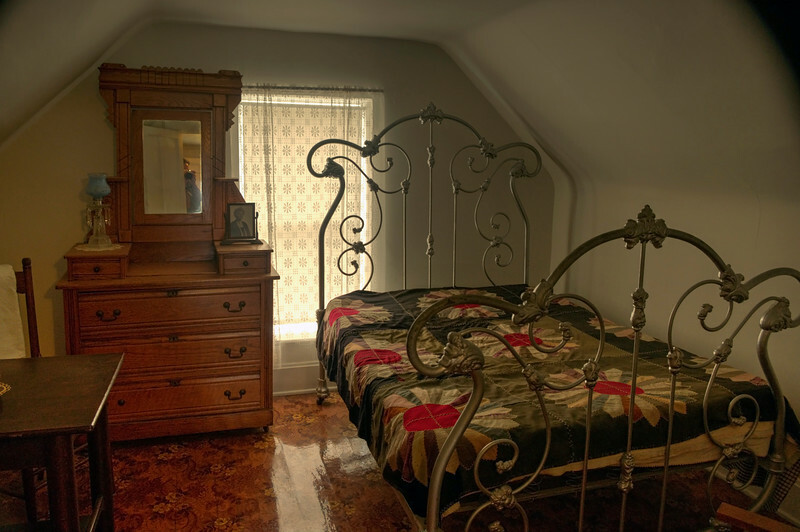 His property in Lucas was developed to produce income in his retirement as an attraction. Here, the concrete statuary depicts a soldier aiming his gun at a Native American. The native is aiming his bow at a dog (not seen in this photo), and the dog is after a fox, the fox is after a bird, the bird is after a little worm, which is eating a leaf. And so it goes. The Garden of Eden, Lucas, Kansas. 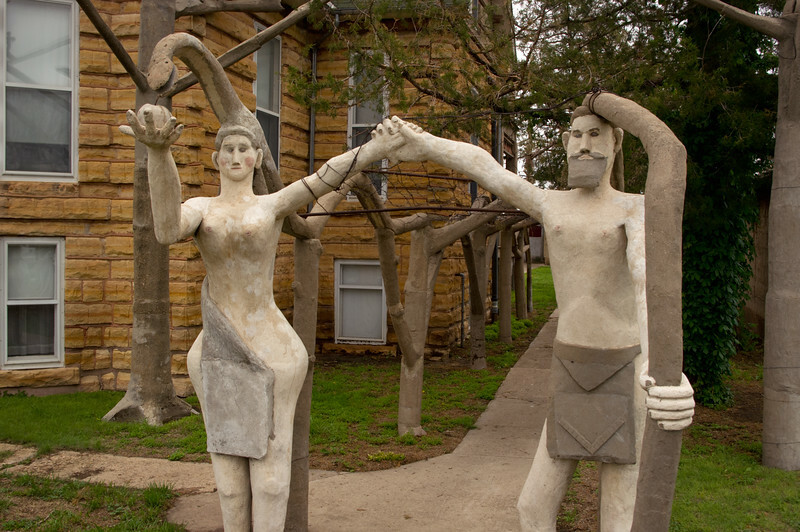 Adam and Eve, and many other aligorical characters, were created in concrete by Samuel P. Dinsmoor. Concrete statuary at The Garden of Eden, Lucas, Kansas. These aligorical characters, were created in concrete by Samuel P. Dinsmoor. Concrete statuary at The Garden of Eden, Lucas, Kansas. These aligorical characters, were created in concrete by Samuel P. Dinsmoor. 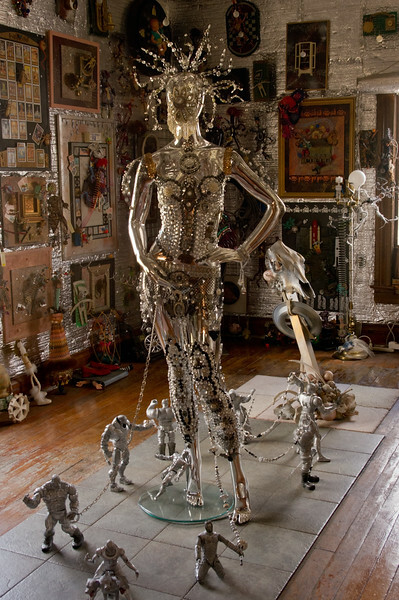 The museum tour explains the stories behind the statues, as seen by the free thinking Dinsmoor. This pyramid-shaped mausoleum was built by Samuel P. Dinsmoor from local limestone 'logs' - notice the "log cabin" notched corners. The angel on top is made from concrete. Inside, Dinsmoor can be seen in his glass covered coffin. 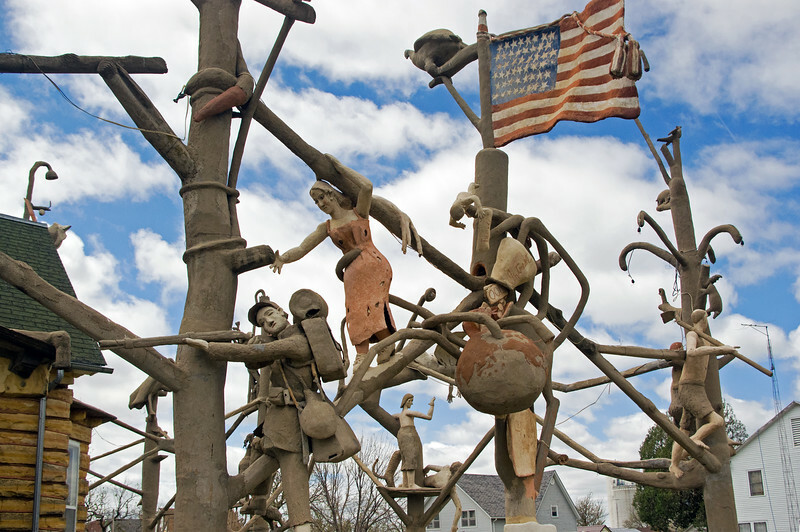 Located at The Garden of Eden, an attraction built by Dinsmoor in Lucas, Kansas. 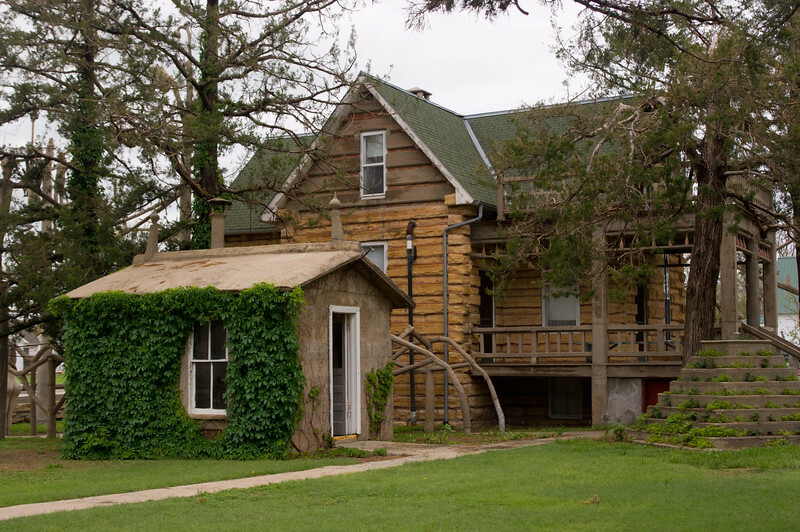 "Log" home built by Samuel P. Dinsmoor is actually made from limestone - notice the notched corners. 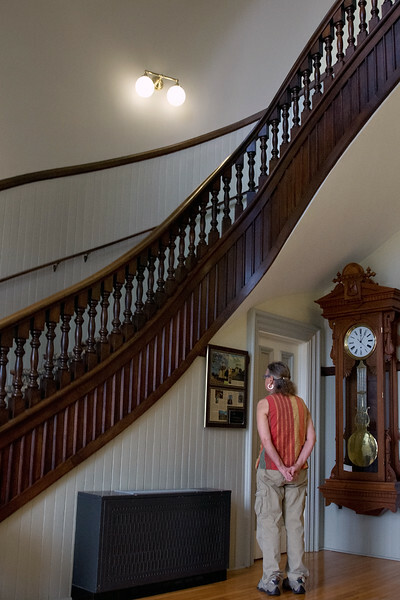 Dinsmoor's home is part of an attraction in Lucas, Kansas, now called The Garden of Eden. 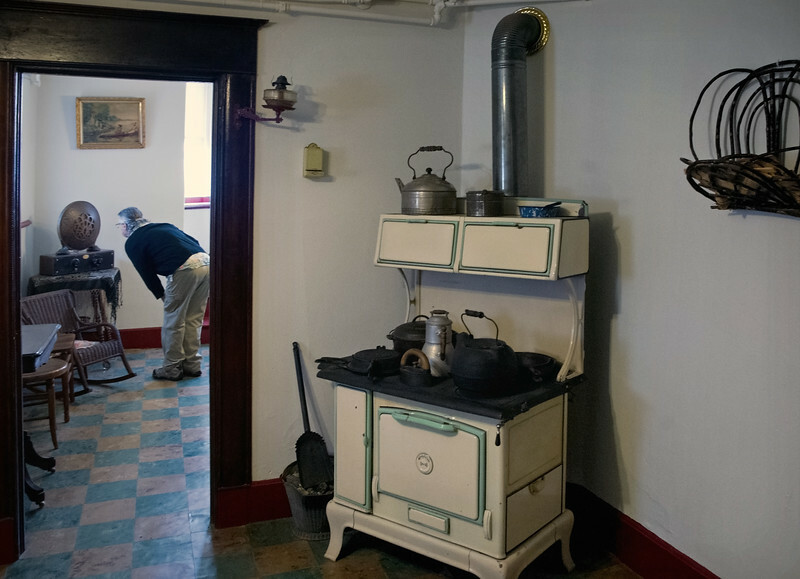 Enameled kitchen stove, inside Samuel P. Dinsmoor's Cabin Home, Garden of Eden. 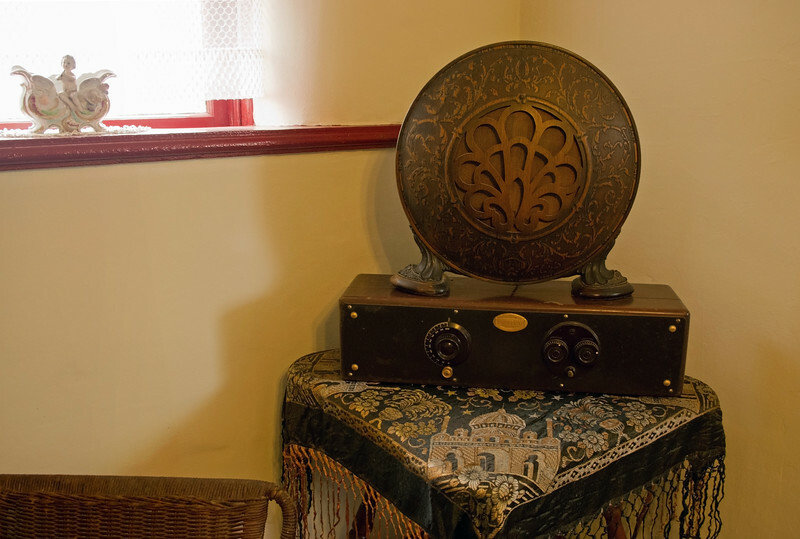 Rita is looking at an old Atwater-Kent radio. 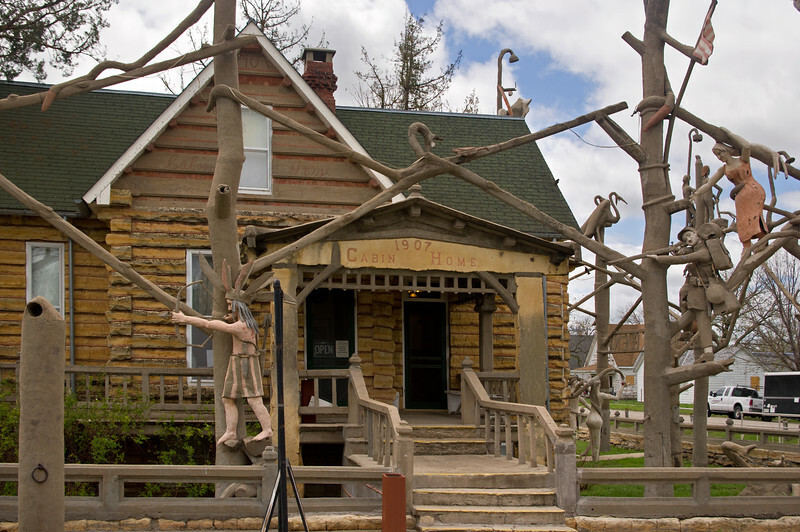 The Garden of Eden is an attraction built by Dinsmoor in Lucas, Kansas. 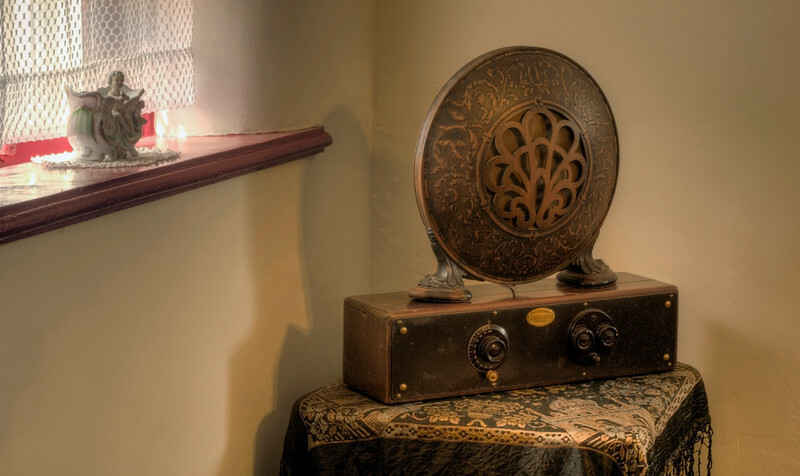 Antique Atwater Kent radio, inside Samuel P. Dinsmoor's Cabin Home. 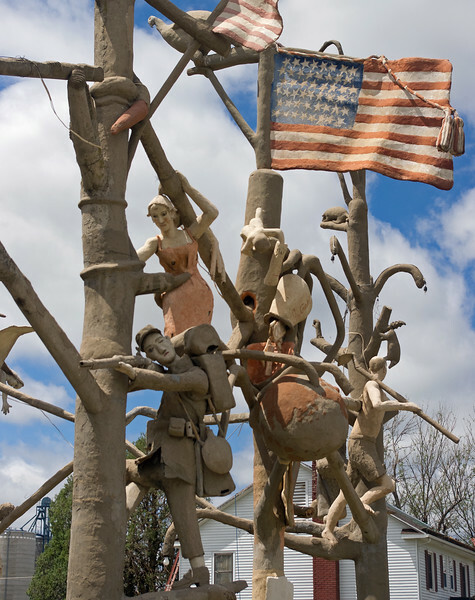 The Garden of Eden is an attraction built by Dinsmoor in Lucas, Kansas. 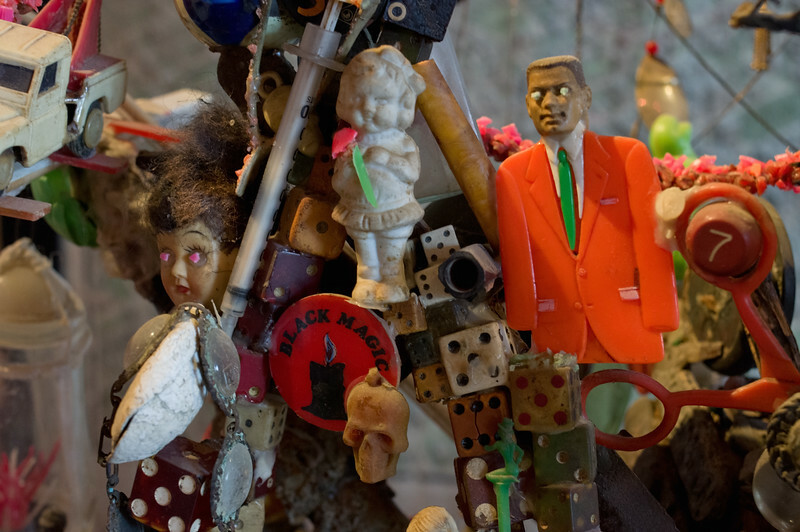 Assemblage of found objects by artist John Woods, on display at the Grassroots Art Center in Lucas, Kansas. Many of the objects were found in the mud when a lake in MacArthur Park, Los Angeles was drained. Rita playing the Name Game. 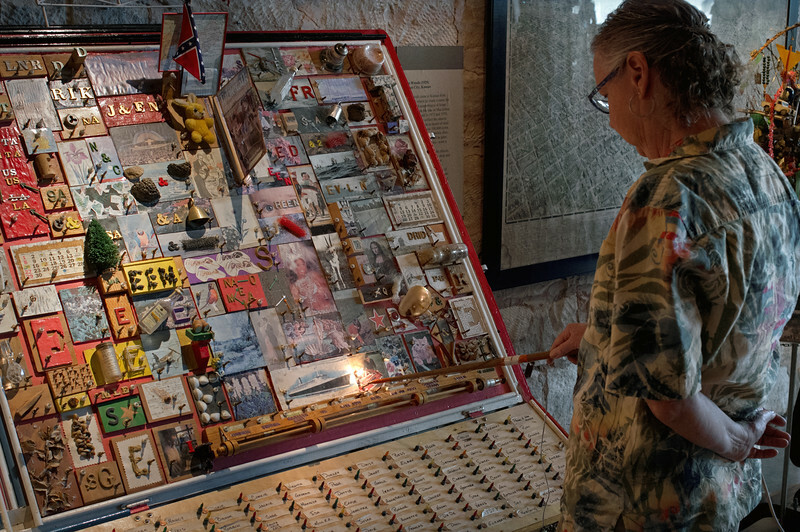 The interactive board was created by artist John Woods, and is on display at the Grassroots Art Center in Lucas, Kansas. 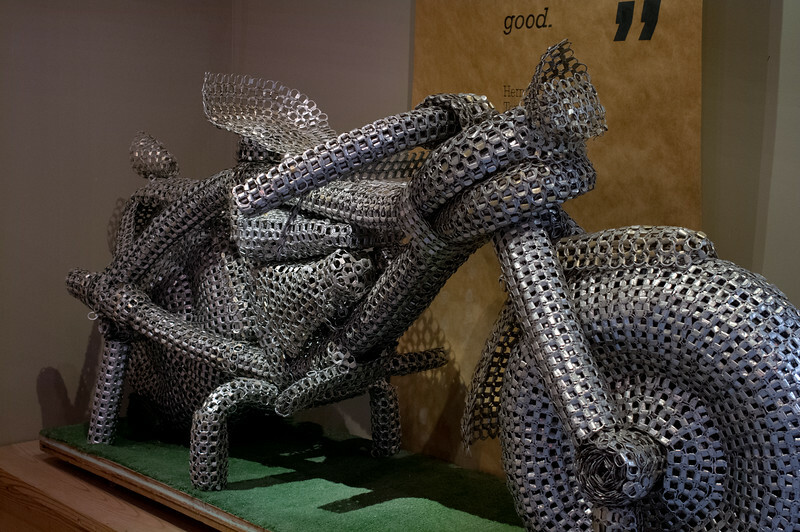 Motorcycle made from aluminum pull tabs by artist Herman Divers of Topeka, Kansas. 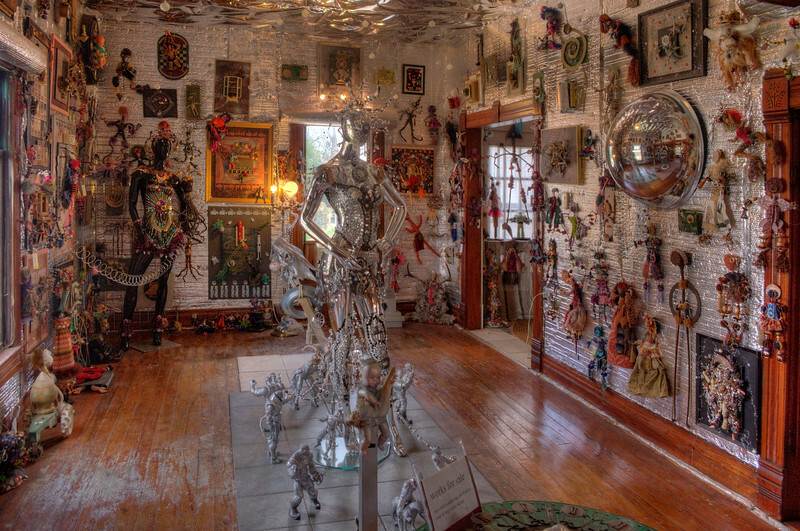 Grassroots Art Center in Lucas, Kansas. 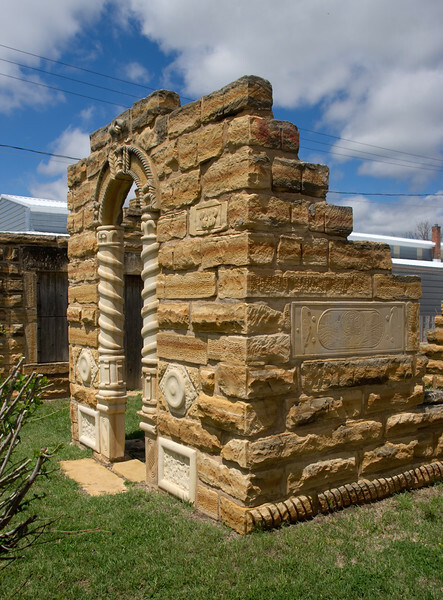 "Post rock" - a type of local limestone found in central and north central Kansas, is used for both buildings and fence posts. 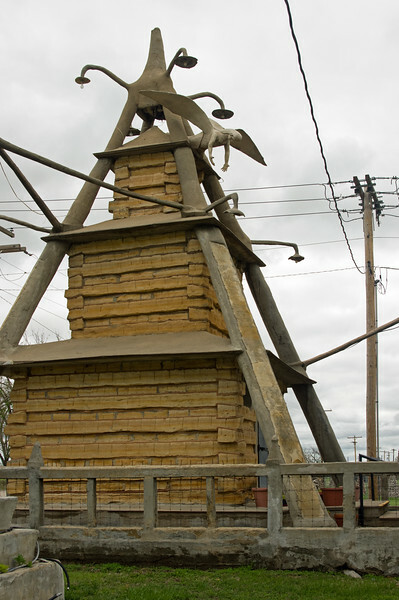 This demonstration structure is in the Post Rock Limestone Courtyard behind the Grassroots Art Center in Lucas, Kansas. 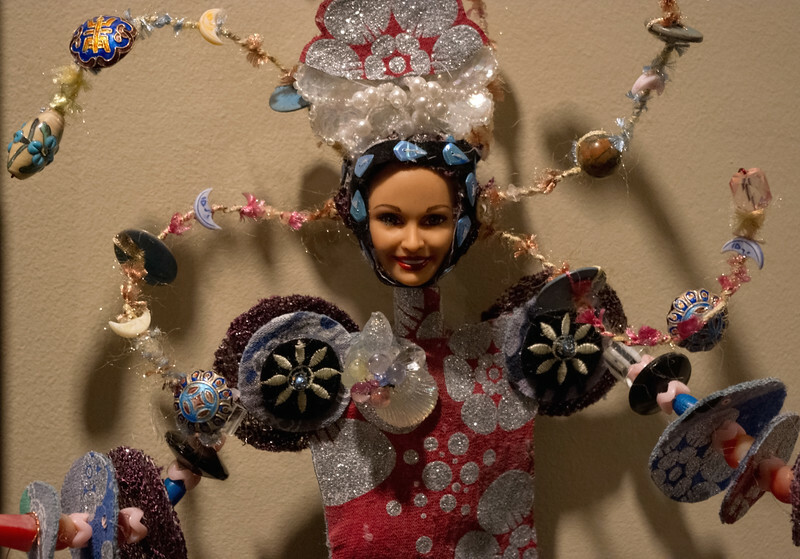 Artist Mri-Pilar combines found objects with dolls to create "Re-Barbs" (recycled Barbies). 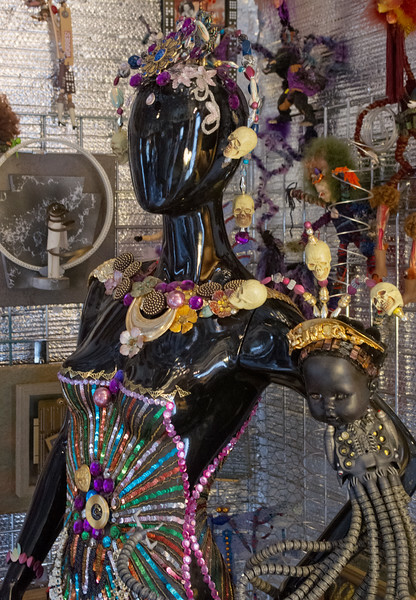 Her exhibit "Garden of Isis" occupies the inside of the Deeble House, which is part of the Grassroots Art Center in Lucas, Kansas. Artist Mri-Pilar's exhibit - "Garden of Isis" - is inside of the Deeble House, which is part of the Grassroots Art Center in Lucas, Kansas. Artist Mri-Pilar's exhibit "Garden of Isis" - inside of the Deeble House, which is part of the Grassroots Art Center in Lucas, Kansas. Artist Mri-Pilar's exhibit - "Garden of Isis" - inside the Deeble House, which is part of the Grassroots Art Center in Lucas, Kansas. 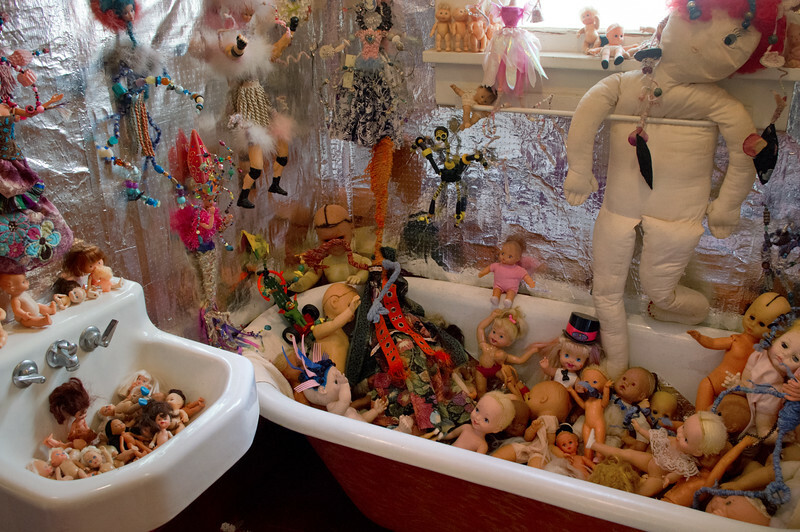 Artist Mri-Pilar's exhibit - "Garden of Isis" - bathroom of the Deeble House is filled with dolls. 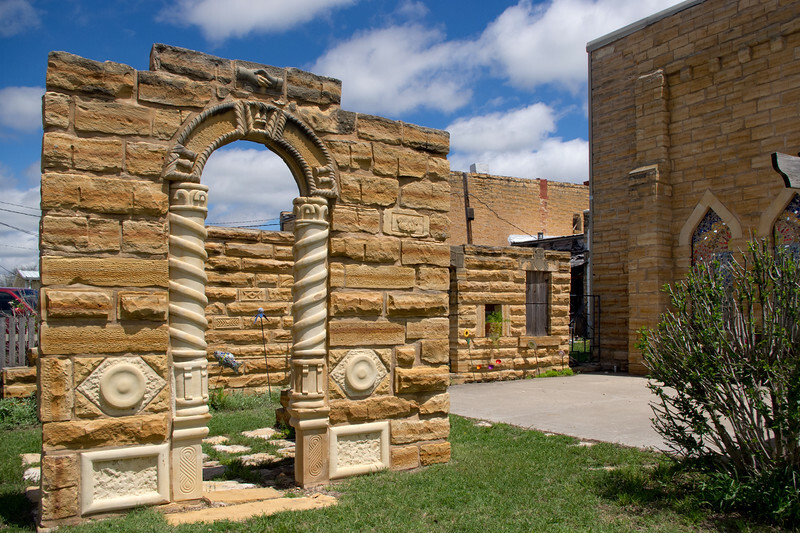 Grassroots Art Center in Lucas, Kansas. 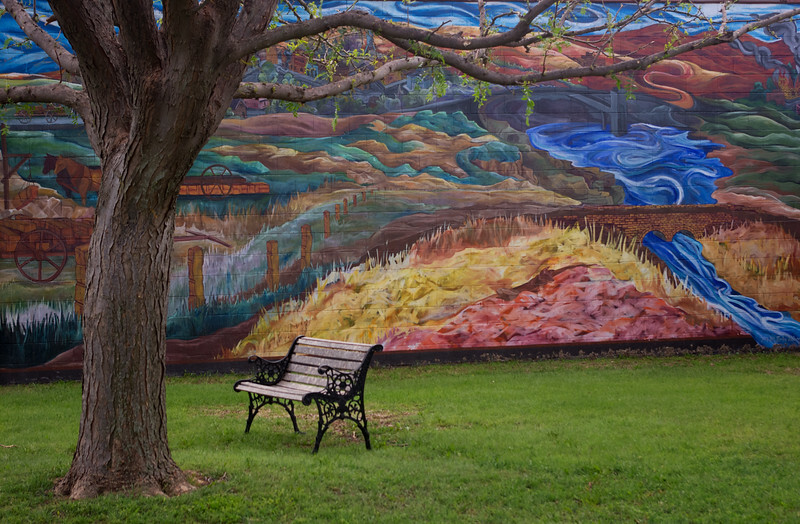 Tree, bench and painted wall. Mural painted by Erika Nelson, Lucas, Kansas. 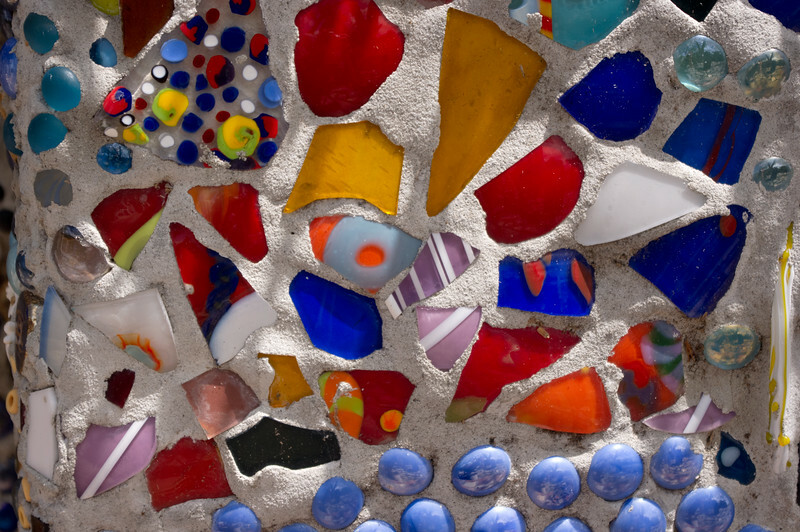 Mosaic detail, the Bowl Plaza, Lucas Kansas. 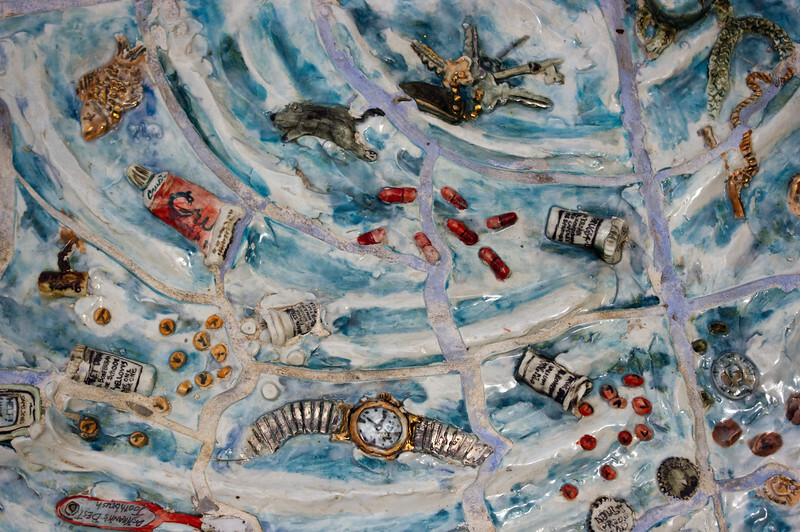 Porcelain artwork, by Eric Abraham, recalls all the random objects humans have flushed down the toilet bowl. The Bowl Plaza, Lucas Kansas. 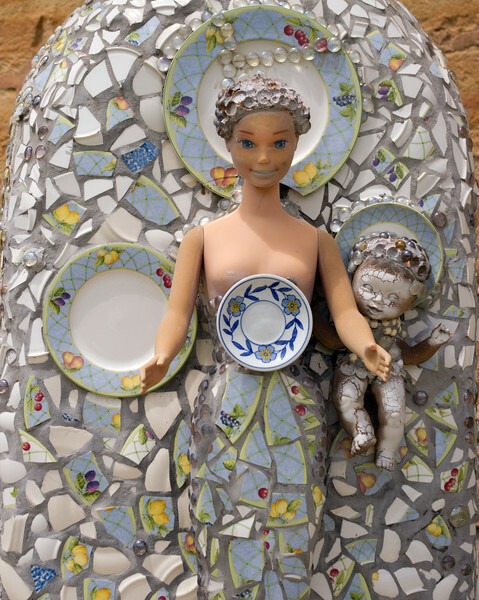 Mosaic work with doll, the Bowl Plaza, Lucas Kansas. 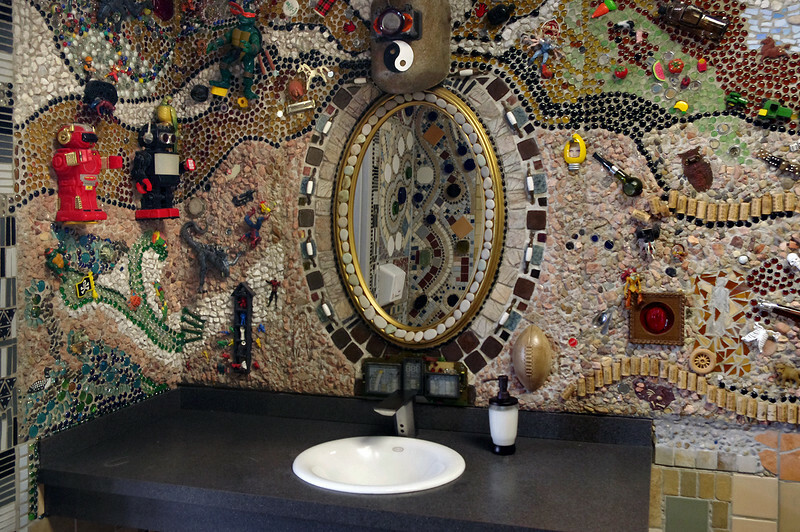 Mosaic work in the public bathroom at the Bowl Plaza, Lucas Kansas. 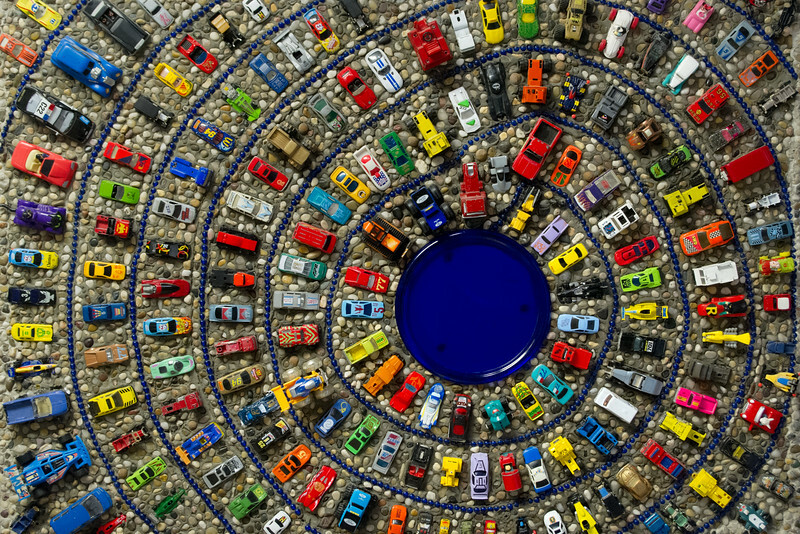 Car mosaic, public bathroom at the Bowl Plaza, Lucas Kansas. 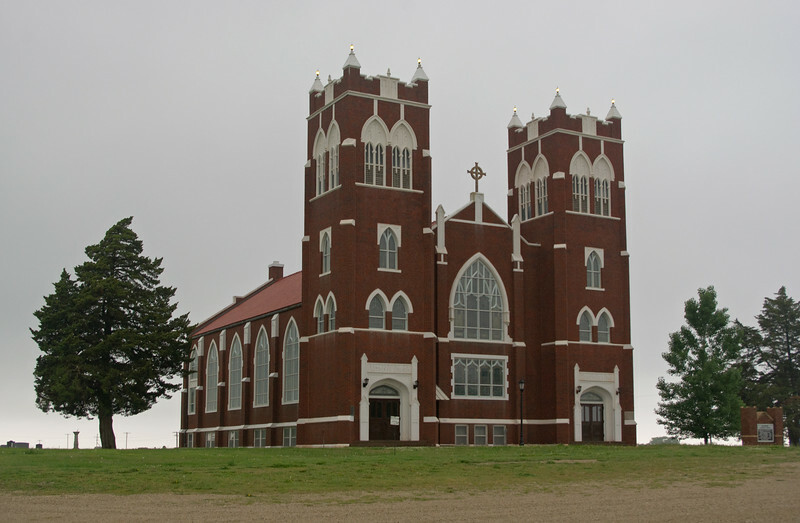 Salemsborg Lutheran Church, Smolan, Kansas, on a rainy day. 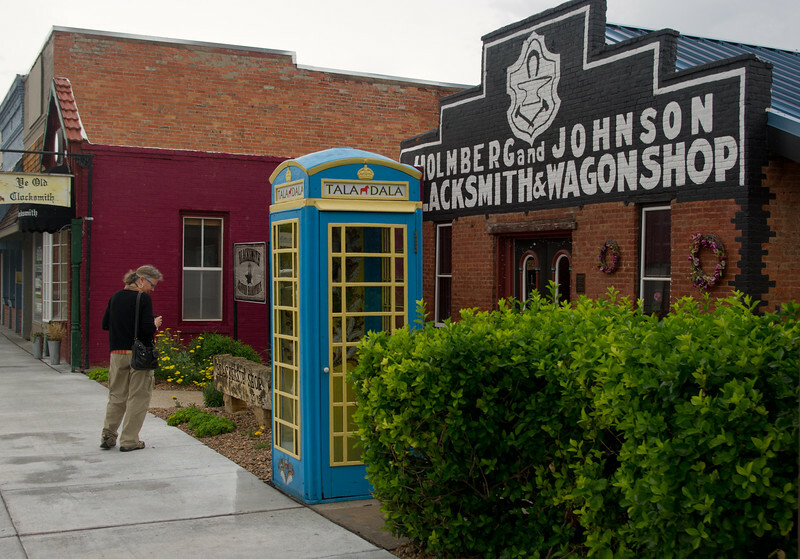 Rita on the streets of Lindsborg, Kansas, in front of the Holmberg and Johnson Blacksmith Shop. 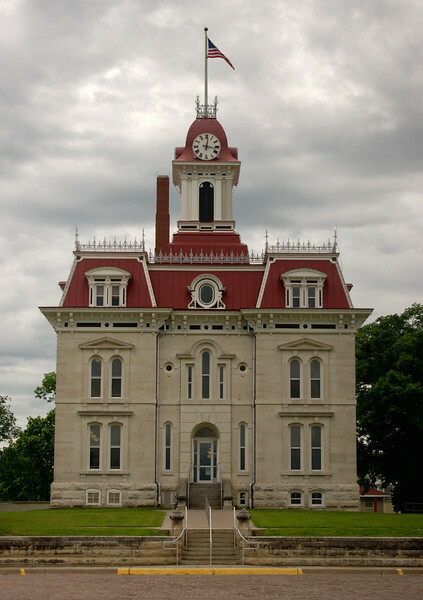 The Chase County Courthouse on a rainy day; Cottonwood Falls, Kansas. Rita in the stairwell of the Chase County Courthouse Cottonwood Falls, Kansas. 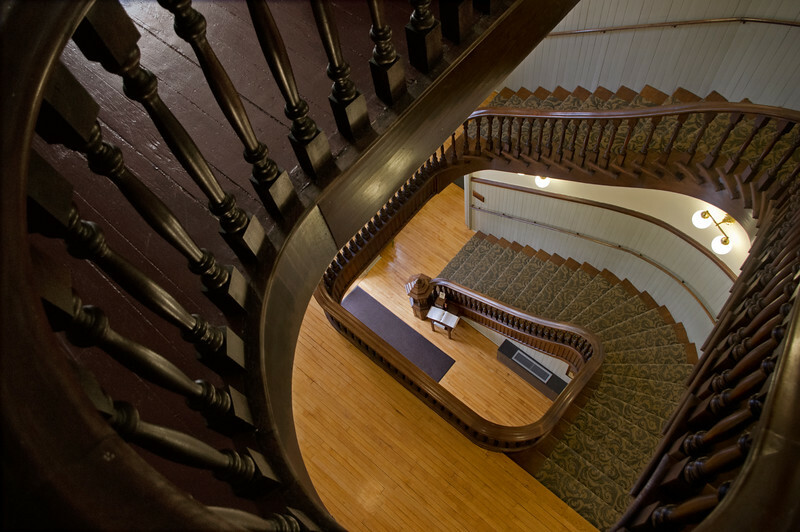 Stairwell inside the Chase County Courthouse; Cottonwood Falls, Kansas. 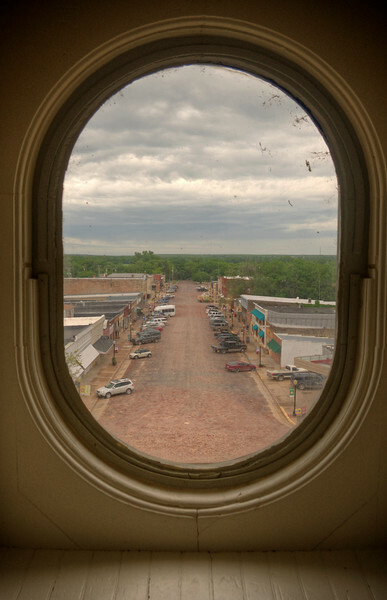 View of Cottonwood Falls, Kansas, from the Chase County Courthouse attic window, on a rainy day.